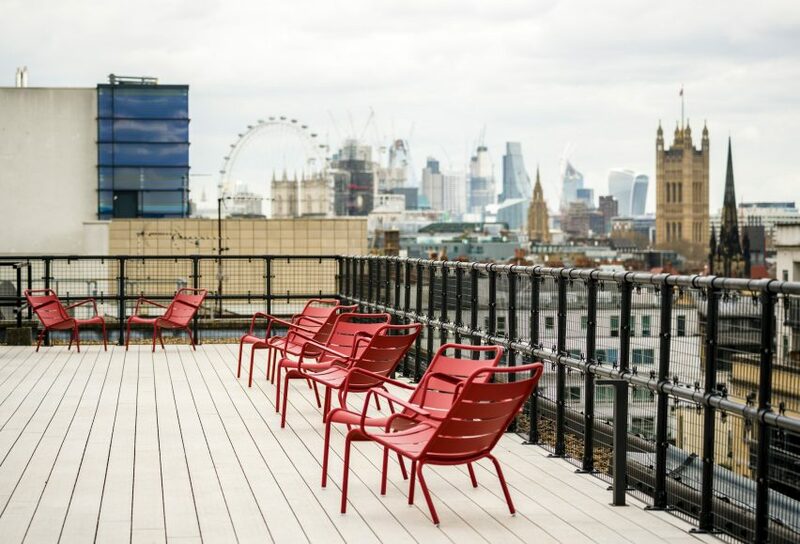 Architecture studio Soda looked to “rigorous” layout of Regency-era squares to create this contemporary co-working space in central London, which features a roof terrace, gym and drinks bar. Thomas House is situated on a corner block in Victoria and takes its name from Thomas Cubitt, a British master builder recognised for his development of several streets in the area in the 1800s. 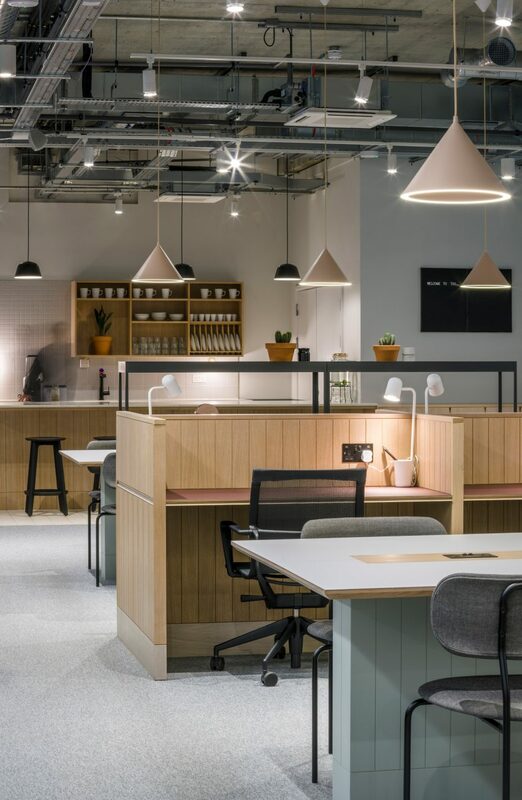 The space has been designed for The Office Group (TOG), who specialise in the creation of flexible work spaces and already have a host of properties across the city, in locations including Kings Cross, Oxford Circus and Shoreditch. 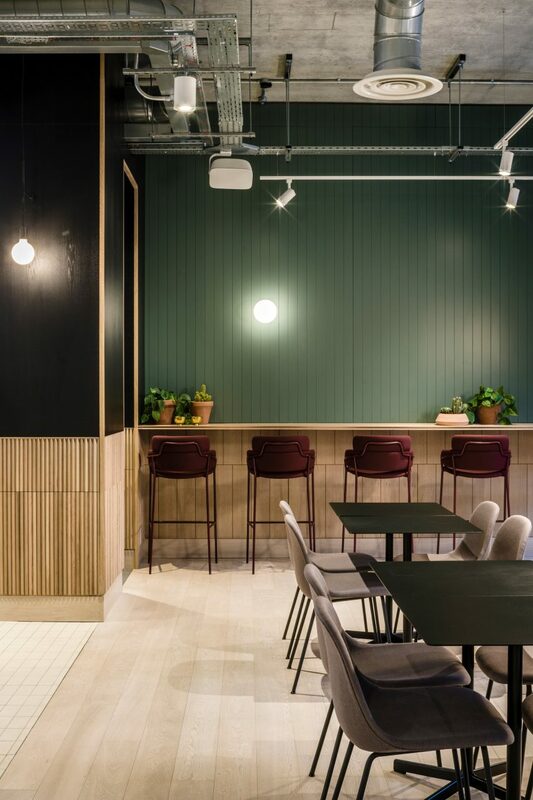 For this 6,650 square-metre branch, the company approached Clerkenwell-based studio Soda to design a modern co-working office that nodded to the location’s architectural history. While the building was erected in 1989, its facade was built to imitate the Regency-style properties that sit in the nearby Eccleston Square. “Thomas House has been created inside a late 20th century building masquerading as a Georgian block, which presented its own challenges in terms of identity,” Russell Potter, Soda’s director, said in a statement. “Through the use of a set of consistent design principles throughout the scheme, the design team was able to unify existing materials, textures and finishes that differed widely into a coherent design language,” added William Smyth-Osbourne, an architect at the studio. Starting with the building’s large entrance hall, the studio decided to reference the “rigorous” layout of typical Regency residential squares. Timber-clad volumes have been inserted to outline a reception, meeting area and smaller work rooms. For the office’s decor the architects then attempted to emulate the colour palette of traditional Regency-era interiors. While a majority of the rooms has been kept muted, feature walls have been painted in a shade of sage green and soft furnishings appear in variations of maroon red or pale grey. “All elements were designed to have a contemporary, progressive feel – reflective of entrepreneurial users of a TOG building – whilst being informed by the historic precedents,” Smyth-Osbourne told Dezeen. Features at the building include a gym, drinks bar, library, meditation room and a roof terrace that provides vistas across the city. All of these communal areas have been placed at a central point between the building’s two wings so that visitors can naturally gather and socialise. Soda, who were established in 2010, has previously transformed an old print works in east London into a distillery. 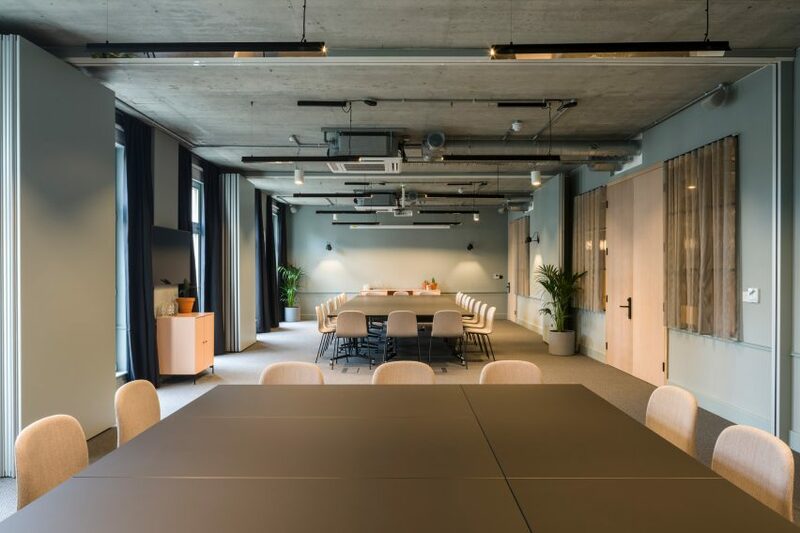 Its Thomas House project joins several other shared workspaces that have opened in the capital this year – Squire and Partners designed The Ministry, a co-working office and members club in Elephant and Castle, while Surman Weston opened a flexible work space inside a Victorian church in Islington.